Kyoto Prefecture (京都府, Kyōto-fu) is a prefecture of Japan located in the Kansai region of the island of Honshu. The capital is the city of Kyoto. Until the Meiji Restoration, the area of Kyoto Prefecture was known as Yamashiro. For most of its history, the city of Kyoto was the Imperial capital of Japan. The history of the city itself can be traced back as far as the 6th century. In 544, the Aoi Matsuri was held in Kyoto to pray for good harvest and good weather. Kyoto did not start out as the capital of Japan. A noteworthy earlier capital was Nara. In 741, Emperor Shōmu moved the capital briefly to a place called Kuni-kyo, between the cities of Nara and Kyoto, in present-day Kyoto Prefecture. In 784, the capital was moved to Nagaokakyō, also in present-day Kyoto Prefecture. In 794, Emperor Kammu moved the capital to Heian-kyo, and this was the beginning of the current-day city of Kyoto. Even today, almost all of the streets, houses, stores, temples and shrines in the city of Kyoto exist where they were placed in this year. Although in 1192 real political power shifted to Kamakura, where a samurai clan established the shogunate, Kyoto still remained the imperial capital as the powerless emperors and their court continued to be seated in the city. Imperial rule was briefly restored in 1333, but another samurai clan established a new shogunate in Kyoto three years later. In 1467, a great civil war, the Ōnin no Ran, took place inside Kyoto, and most of the town was burned down. Japan plunged into the age of warring feudal lords. A new strong man, Tokugawa Ieyasu, established the shogunate at Edo (today's Tokyo) in 1603. In the 15th century AD, tea-jars were brought by the shoguns to Uji in Kyoto from the Philippines which was used in the Japanese tea ceremony. The provincial system merged the former Tango Province, Yamashiro Province and the eastern part of Tanba Province into today's Kyoto Prefecture. 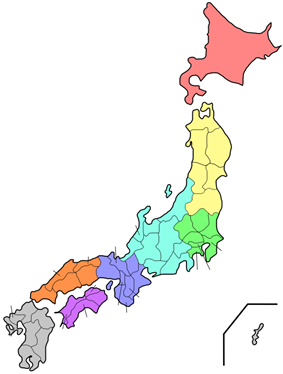 Kyoto Prefecture is located almost in the center of Honshu and of Japan. 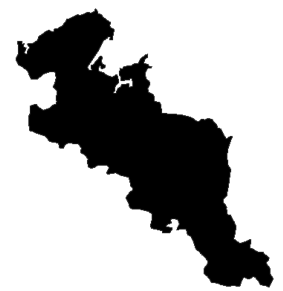 It covers an area of 4,612.71 square kilometres (1,780.98 sq mi), which is 1.2% of Japan. Kyoto is 31st by size. To the north, it faces the Sea of Japan and Fukui Prefecture. To the south, it faces Osaka and Nara Prefectures. To the east, it faces Mie and Shiga Prefectures. To the west, it faces Hyōgo Prefecture. The prefecture is separated in the middle by the Tanba Mountains. This makes its climate very different in the north and south. As of 1 April 2012, 6% of the total land area of the prefecture was designated as Natural Parks, namely Sanin Kaigan National Park; Biwako, Tango-Amanohashidate-Ōeyama and Wakasa Wan Quasi-National Parks; and Hozukyō, Kasagiyama, and Rurikei Prefectural Natural Parks. The city of Kyoto is largely dependent on tourism. Northern Kyoto on the Tango Peninsula has fishing and water transportation, and midland Kyoto has agriculture and forestry. Nintendo is headquartered in the city of Kyoto. Kyoto has been, and still remains to this day, the cultural center of Japan. For over 1000 years it was Japan's capital. When the capital was changed to Tokyo, Kyoto remained Japan's cultural capital. See Culture of Japan. The sports teams listed below are based in Kyoto. The city of Kyoto is one of the most popular tourist spots in Japan, and many people from far and wide visit there. 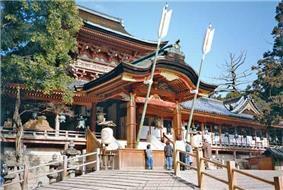 Along with Nara, Kyoto is a favorite location for the graduation trip of Elementary and Junior High schools. Some of the festivals held in Kyoto are Aoi Matsuri from 544, Gion Matsuri from 869, Ine Matsuri from the Edo-era, Daimonji Gozan Okuribi from 1662, and Jidai Matsuri from 1895. Every shrine and temple holds some sort of event, and many of them are open for public viewing. On August 1, 2013, prefectural and municipal authorities gave consent for a USFJ missile monitoring station to be set up in the city of Kyōtango. It will be co-located with a JASDF facility already based in the city. At least initially, its primary sensor will be a mobile X-band radar used to gather data on ballistic missile launches which will then be relayed by the station to warships equipped with Aegis air defense systems and to ground-based interceptor missile sites. A hundred and sixty personnel will be based at the station. The current governor of Kyoto is former Home Affairs Ministry bureaucrat Keiji Yamada. He has been reelected to a fourth term in April 2014 with support from the major non-Communist parties against only one JCP-supported challenger. The prefectural assembly has 60 members from 25 electoral districts and is still elected in unified local elections (last round: 2011). As of September 2013, it was composed as follows: Liberal Democratic Party 25, Democratic Party 14, Japanese Communist Party 11, Kōmeitō 5, Kyōto sōsei forum 1, Japan Restoration Party 1. Kyoto's delegation to the National Diet consists of six members of the House of Representatives and four members (two per election) of the House of Councillors. After the national elections of 2010, 2012 and 2013, the prefecture is represented by four Liberal Democrats and two Democrats in the lower house, and two Liberal Democrats, one Democrat and one Communist in the upper house. The prefectural flower of Kyoto is the weeping cherry. The Kitayama Sugi is the official tree, and the streaked shearwater the bird that symbolizes the prefecture. These relationships are distinct from those of cities in Kyoto Prefecture with other cities. ^ Nussbaum, Louis-Frédéric. (2005). "Kyoto-fu" in , p. 587Japan Encyclopedia, p. 587, at Google Books; "Kansai" in , p. 477Japan Encyclopedia, p. 477, at Google Books. ^ Nussbaum, "Kyoto" in , pp. 565-587Japan Encyclopedia, p. 585, at Google Books. ^ "Peringatan 25 Tahun Sister City Kyoto-Yogya, Kedua Kota Mendapat Manfaat" (in Indonesian). Koran Tempo. October 6, 2010. Retrieved May 20, 2014.